- Wednesday, April 17th- 7-9 p.m. This two-hour session will take years off of your learning curve. We guarantee it!!! New! Pay the $5.00 Fee here and get a $10.00 MRO Gift Card!....that's right, we'll pay you $5.00 to take this class! Otherwise, please call the shop to register for FREE. Mad River Outfitters is proud to offer our "Price Match Guarantee". Quite simply, we won't be undersold in our industry! If you find a lower price on the same item, in new and in stock condition, please contact us and we will meet...or BEAT the offer in almost* any and all cases. This offer obviously applies to the time of the sale only. We simply cannot offer refunds if an item is found at a lower price after the sale has been made. This offer also applies to items that are in stock and available for immediate purchase with the company advertising the lower price. Please understand that we can't be asked to match a price on an item that you cannot actually buy at the advertised price. The price matched will also always be the "Shipped" price as many vendors do not offer Free shipping as we do. We will be happy to match the price of the item which includes the shipping cost from the retailer we are matching. To take us up on this guarantee, please contact us or send us an e-mail. We will be happy to help. **Please note that we cannot, and won't entertain matching prices with Amazon. They are NOT a fly shop and doing their best to undermine our long standing industry. We are not going to participate in this so please don't inquire about matching prices with Amazon. If you need to buy from them, go ahead but we'd encourage you to support an actual fly shop if you are looking to buy fly fishing gear. Sorry for the rant but Real Fly Shops are a dying breed and Amazon isn't helping this. * this offer of course excludes liquidated merchandise, used/e-bay merchandise, going out of business sales etc. where a company may be taking pennies on the dollar....which is happening out there. Regardless, feel free to contact us to discuss. We will always do our best to help. This is a great way to get introduced to the sport! This two-hour session will take years off of your learning curve. We guarantee it!!! 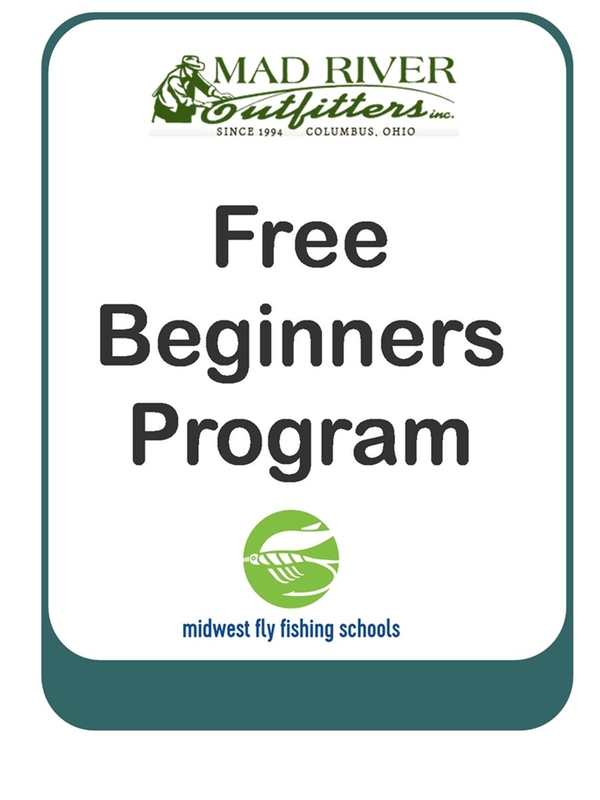 Join us for an informative session on Getting Started in Fly Fishing which covers the basics on what you need to do to get the ball rolling, where to go, and what further steps to take to become a proficient fly fisher. We will take a look at the 6 basic things that you need to understand and also clear up some of the common myths and misconceptions that surround the sport. These are scheduled periodically throughout the season. Please refer to our seasonal newsletter or the Calendar page of this website for future dates. This class is well worth the investment. * no equipment or experience necessary. You may want to bring along a notepad and pen. A basic handout that outlines the program will be provided. New! Register for this class online for $5.00 and the night of the class we will present you with a $10.00 Mad River Outfitters Gift Card! So not only is this class now FREE.....but we are paying you $5.00 to attend! Otherwise, you can call the shop directly to register and decline our $5.00 Gift. For information on shipping, returns, our guarantee and more....please see our FAQ page. Note: We've decided to stop using BuySafe in favor of Google Trusted Stores.